Eurolot (eurolot.com) (Warsaw) has converted options on six Bombardier DHC-8-402s, marketed as the Q400 NextGen airliners, to a firm order that will increase its fleet to 14 aircraft. Eurolot’s firm order for eight airliners with 12 options was announced on March 9, 2012, and delivery of the first aircraft was announced on May 17, 2012. Including this transaction, Bombardier has booked firm orders for 460 Q400and Q400 NextGen turboprops,and delivered aircraft are in service with more than 40 operators in 33 countries, on six continents. These aircraft have transported more than 227 million passengers and have logged more than 3.5 million flight hours and over 3.8 million take-offs and landings. Copyright Photo: Andi Hiltl. DHC-8-402 SP-EQC (msn 4408) approaches Zurich for landing. This entry was posted in EuroLOT and tagged 4408, aviation, Bombardier, Bombardier DHC8, Bombardier DHC8400, Bombardier Q400, DHC8, DHC8400, DHC8402, EuroLOT, eurolot.com, frameable prints, prints and posters, Q400, SPEQC, transportation, ZRH, Zurich on September 4, 2012 by Bruce Drum. 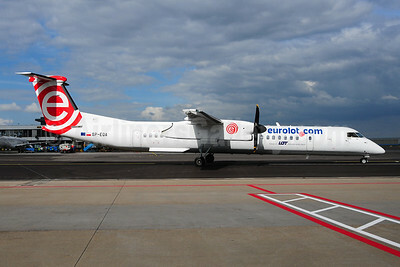 EuroLOT (eurolot.com) (Warsaw) took delivery of its first three new Bombardier DHC-8-402s (Q400s) in May with the pictured SP-EQA (msn 4406) arriving first on May 18. The carrier opened new routes to Amsterdam from Gdansk (three flights a week) and Krakow (four flights a week) and to Bremen from Gdansk (three flights a week) on June 6. Copyright Photo: Ton Jochems. 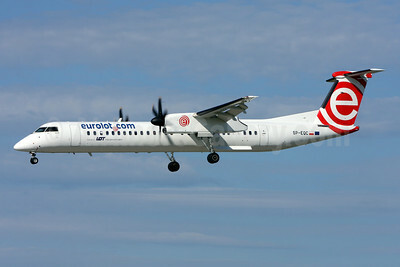 The arrival of the Q400s spawned this updated 2012 livery which now features web titles and a reverse red and white tail logo. This entry was posted in EuroLOT and tagged 4406, AMS, Amsterdam, aviation, Bombardier, Bombardier DHC8, Bombardier DHC8400, Bombardier Q400, DHC8, DHC8400, DHC8402, EuroLOT, eurolot.com, Q400, SPEQA, transportation, travel on June 19, 2012 by Bruce Drum.